Not exactly the digital equivalent of a Lexus, mind you. Cyberspace is a children's cartoon on PBS. The series centers on three kids and one non-kid — white farmboy Matt, token black girl Jackie, token Hispanic girl Inez, and wisecracking scratchily-voiced cyborg-dodo bird Digit — who must protect Cyberspace from Hacker the Hacker, a green-pigmented computer virus who bears a passing resemblance to Elvis. Using their STEM skills, the four are able to beat Hacker at his game every time. 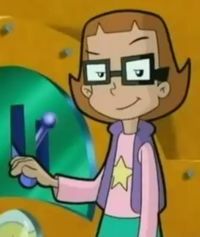 Cyberchase is noted for drawing a wide amount of attention to reputable but lesser-known professions like zoo-keeping, programming, witchcraft, clone-catching, and ruling virtual realities, professions of which have been known to require intense critical thinking skills. In fact, if you were to ask any successful early-20s architect about Cyberchase, many of their faces would light up and an astonishing number would recall using areas to prove the villainous Hacker innocent and find a cure for Motherboard's virus. And if you were to ask any successful early-20s cyber-terrorist about Cyberchase, they would remember how Hacker made the cure temporary, leaving himself with land the size of the Warren's, rock-star sunglasses, and a nice glass of lemonade. For those without comedic tastes, the so-called experts at Wikipedia have an article about Cyberchase. However, some watchers of the show do experience discrepancies later between their ideal professions and reality. In the case of a "For Real" segment, a woman is expected to decorate 12 trays of donuts instead of simply 12 donuts. She decides to estimate the number of donuts she really has to decorate, taking about 20 minutes. She uses the remaining 20 seconds of her time to actually do the work. Children will find that in the real world, putting aside 20 seconds to decorate 400 or so donuts will get them fired. That is, assuming they can get over the shock of not having "being able to calculate the number of robot clones there are running around a city using multiplication" as a job requirement. "Me, WordGirl? My large vocabulary is solely for the purpose of characterization, thank you very much." Matt – As the only male in the Cybersquad, Matt enjoys annoying Inez, learning about Greek mythology and/or Star Wars, and mud-wrestling pigs on his family farm. He tends to learn best physically, as evidenced by the yo-yo he is constantly seen playing with. Like a true pack rat, his backpack holds all sorts of colorful memorabilia, again mostly relating to Greek mythology and/or Star Wars. Recently, producers have considered replacing him with Slider, a "bad boy" skateboarder who lost his father, in an effort to satisfy the preteen girl fandom. Inez – The youngest girl in the Squad with so little fashion sense as to wear an unattractive star on her shirt, Inez is otherwise a sensible, intelligent girl that acts as the mediator between the Cybersquad's frequent quarrels. She uses advanced vocabulary and stands on her head to think better. She also has shown various signs of affection for Slider, allowing him to call her "Nezzie", and noting how different he is from that pig-carrying farmboy that keeps tagging along. Jackie – The girl obsessive with organization, Jackie often finds that her compulsions to rid the world of disorder helps the Squad in every situation, no matter what it is. If they want to have a snack, she's the one to divide the bags of chips between the Cybersquad in terms of a saltiness-to-crunchiness-to-satisfaction ratio. Her main goal in life is to eradicate anything that elicits one of her "ew, ew, and double ew"'s. She also is known to be melodramatic and has a crush on Slider as opposed to a nearby Star Wars nerd. Digit – Looking innocently like a robot bird, Digit's hardened Brooklyn accent shows the tough crimes he has committed over his lifetime, from when he used to work for Hacker. His beak can turn into drills, keys, and spoons, but tends to scrunch up rather easily. He is known for his hard prison look, a leftover from his Hacker days, consisting of an intimidating red cap worn backwards and his sharp red bow-tie, showing that when it comes down to it, this guy means business. Motherboard – The ruler of Cyberspace that gives you an uneasy feeling every time you glance at her poorly-rendered CGI face (or worse, her bulging left eye). Despite her questionable motives, she still holds the only position in Cyberspace as a floating three-dimensional head. Hacker – Carrying a mild green skin condition, Hacker (that's The Hacker to you) is a pompous and power-hungry computer virus with aspirations to be the next ruler of Cyberspace. He is known for his flamboyance and odd eccentricities, perhaps the reason why he was fired from his previous job as Motherboard's assistant. Buzz and Delete – Hacker's donut-loving lackeys, with Buzz being the obese, scrawny one and Delete being the tall, lanky one. They are in truth soft and vulnerable to trickery and deceit (particularly Delete), but like Digit, their gruff Brooklyn accents give off the false impression of them being tough guys. Cyberchase was created as a last-ditch attempt to catch the American youth up with STEM: Science, Technology, Engineering, and Mathematics. Previously, the National Science Foundation wanted to jump the gun and get right into the Science, Technology, and Engineering – basically a cartoon version of Bill Nye the Science Guy. Not a bad idea, but in the midst of an ADHD epidemic, serious thought was instead put into creating a world rich with detailed landscapes, accumulative curricula, and multidimensional characters. Of course, such radical ideas were met with initial opposition. Matt’s Father: "Mud-wrestling pigs, playing with his yo-yo, watching Star Wars, and listening to Will Smith — that’s all my Matt ever does. Oh, mathematics. The poor lad would get more money step-dancing to a tin whistle in the subway. You are familiar with the notion that all descendants of working-class foreigners are absolutely incapable of learning. It’s true. So good luck trying to teach my boy your fancy hullabaloo, because I know he’ll be running back to the farm before you know it, and with any luck, he’ll learn his numbers at the checkout counter buying POTATOES for the family." Jackie’s Drama Teacher: "I can’t help but feel as if this mathematics program is an extraneous addition to Jackie’s career. She is destined to be a world famous celebrity as soon as she gets out of elementary school, and I seriously doubt she’ll need to know how to add fractions once she wins the hearts of Black America’s youth. In fact, I don’t even need to listen to you. I’ve seen her sing, I’ve seen her dance, and she has what it takes to get to the top. Want an autographed scrunchie?" Inez's Accelerated ELA Program: "Ostensibly, the particular notion of the extra-dimensional aspect of lower-discipline mathematics may indeed be one worth prospecting, yet I must venture a premonition of the foreboding physical detail into this assignment. It strikes me of great concern that Inez, a young prepubescent with a uniquely gifted specialization in the intelligence quotient as compared to that of her peers, may find some lack of mental stimulation in lieu of the intensive physical exertions. As such, I strongly discourage her participation in said event." Day 5: "Taught the kids 'algebra' and 'combinatorial theory' in hopes of getting more funding. However, parents also think children are ready for calculus after five shows. Worst case scenario, we have this: 'Calculus – Sometimes you can solve problems by thinking of the answer as a very accurate estimate.' Hopefully, this lesson can be tied in to a robot dinosaur planet or something." Day 8: "Must introduce new villains every now and then, starting with Wicked, a generic evil love interest for the generic evil cyborg. In retrospect, if Hacker wasn't so evil, there wouldn't be a need for so many excuse plots. For that matter, if Motherboard wasn't so creepy-looking, the world might be a better place." Day 33: "For some bizarre reason, Cyberspace is not listed as a valid location for foreign immersion programs. Apparently, Mount Olympus doesn’t have mythological deities roaming about, Egyptian tombs do not contain ROM, and real aquariums aren’t made out of food. Like it matters — kids saved an entire alternate universe from an evil cyborg and they can’t even put it on their college app." Cyberchase has won over 30 awards for its friendly, creative manner of introducing mathematics to their viewers. Parents everywhere have praised the series for developing their third graders' inherent abilities in problem solving while secretly acknowledging the series as a way to help solve their own pesky predicaments. Despite being aimed at children, Cyberchase has also gained an audience of teens and young adults, mainly due to its edutainment value, nostalgic factor (it's been on since the early 2000s), and the unexpected voice talents of Christopher Lloyd, Gilbert Gottfried, Al Roker, and even Tony Hawk. ↑ Apart from that freak bird-machine thing. ↑ Everyone wishes they had a spoon when breaking out of prison. ↑ Body Math – Some parts of a body are proportional to others – the length of one part is always the same multiple of another – so by measuring one part, you can predict the lengths of others, or even the size of the whole creature! ↑ Counter Examples – When people use words like always, never, all or none to claim that something is true, be suspicious! Such claims are often false, and you need only a single counterexample to disprove them. ↑ Ballpark Estimation – To be confident about your solution to a problem, make sure the answer is reasonable — that it's "in the ballpark." ↑ Line Graphs – You can use a line graph to tell a story about how things change, and to make predictions. ↑ Point of View – Because what you see depends on your point of view, different people looking at the same objects can see them differently and disagree about what they are seeing. ↑ Algebra – When you use a letter to stand in for a number that repeats or changes in a problem, you can simplify the arithmetic and make the problem easier to solve. ↑ Combinations – Overwhelmed by choices? Lists, tables and tree diagrams help you master the combinations. This page was last edited on 12 May 2017, at 02:29.